Are you on the fence, Sleepypod Atom VS Sleepypod Air? Let's start with the Sleepypod Atom. It is a discreet pet carrier, no one will ever know what you are carrying unless they hear a meow or a little bark from your petite pooch. It is comfortable for your pet? The recommended weight and dimensions need to be seriously considered. It is ideal for cats no more than 5kg and dogs 3,5kg. The dimensions are 22cm high and 43cm long. For your pet to be comfortable measure them from the tip of their snout to the end of their spine where the tail starts. Some breeds are the recommended weight but are simply too long to fit comfortably in the Atom. Here in lies the problem, it is ideal for slender pets but in many cases as a general statement slender pets are long pets. If your cat or dog are well within the 43cm/16" length recommendation the Atom will be the perfect size for cozy safe travels. How to use the Atom. Your pet will be enclosed in the Atom during times of travel in the car and during take off and landing on a plane for safety. The Sleepypod Atom fits perfectly under an economy airplane seat. However for the duration of adventures depending on your pet you can have the Atom open with the one sided flap for interaction, assuring pats and your pets enjoyment. Whilst they are tucked in their Atom the ultra plush bedding and privacy panels keep your pet safe and comfortable. The Sleepypod Air is an ideal choice if you and your pet are jet setters. It was created with ultimate luxury & comfort for your pet during short and long flights. Your dog or cat will be able to stretch out during travel. The recommended weight of cats is 8kg and dogs 7kg. The dimensions are 27cm high and 56cm long. You will need to check with your airline what the maximum weight allowance is and take the Sleepypod Air carrier's weight of 1,8kg into account. It is easily slips into your luggage's extended handle with the base resting on your suitcase for stable and easy airport transfer walks. You can seamlessly unzip the carrier and take your pet out through border control. When flying the Sleepypod Air compresses in height as well as on it's sides. It can be tucked to fit under the airline seat in front of you during take off and landing. After take off you can pull the carrier out between your feet and it will pop back into it's original size and shape providing maximum comfort for your pet. The Sleepypod Air like the Atom features the privacy panel and ultra plush bedding. Once airborne you can unzip the one side to let your pet have a look around and offer treats if you both feel confident. There is a tether to connect to your pets harness or collar incase they have a panic attack and try to make a run for it. The Sleepypod Air may be a bit bulky and uncomfortable for everyday travel to carry around on your shoulder with the strap. If you are also planning to use it on long road trips and short visits to the vet it is ideal. If you are considering the Air but on the fence because you are concerned it may be too big, you can always make it cosy with your pets favourite blanket or toys. 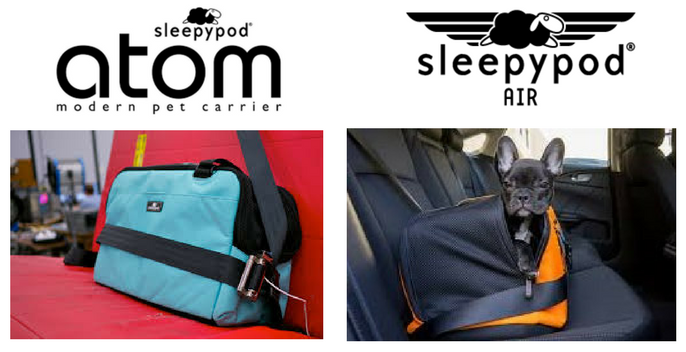 Both the Sleepypod Atom & Air are designed with similar features to ensure your pet feels safe and both simply do not look like 'typical' pet carriers. Which one you decide on will depend on what you will more likely use it for and the size and weight of your pet. If it's an everyday pet carrier you are after & you are the pet parent who walks, cycles or catches trains and planes on occasion the Atom is perfect. The shoulder strap is comfortable & little one will adore the safe and cushy ride. If you are a frequent flyer or planning a long haul journey by plane, train or on the road you need the Air. Even if your pet is smaller than the recommended weight & size, the Air is worth considering based on how you will use the pet carrier. Both have been crash tested to child safety standards, when driving you will secure your Atom or Air on the back seat with the safety belt. Once you get your ideal carrier, it is recommended to leave either your Sleepypod Air or Atom open in your home for a few days or weeks before traveling to let them acquaint themselves and get comfortable. Place small treats in the carrier for your dog or cat and introduce it as a cosy den. Once they are snoozing in it, you will have the green light for testing the carrier and eventually they will happily hop in when you are ready to use it for stress free adventures even to the Vet. Ok, happily does not apply to all pets. There are cats specifically that freak out and anxious dogs that will feel stressed, that is their nature for whatever reason. Both carriers are durable to withstand scratching and you will at least know your pet is safe.